The Dustless blaster is an amazing piece of kit. Versatile, and the way to go for many previously labor demanding tasks. 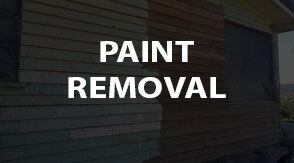 As a painter I found it to be invaluable on a difficult job with a high demand for quality. Totally brilliant service,Dan was more than professional. Everything was done to perfection. I highly recommend them. Great result on the body of my 4runner, done very professional and at a very affordable price. Would recommend to all that need dustless blasting Dan is the guy to see. EnviroPrep Media Blasting is a mobile sandblasting company specialising in wet abrasive blasting in and around the Northern parts of South East Queensland from Redcliffe in Brisbane to Gympie including the Sunshine Coast and inland as far as Kingaroy. However we do travel outside of these areas also. Wet Blasting also known as Vapour Blasting or Dustless Blasting is similar to dry blasting or sandblasting with the introduction of water as a third element. By adding water to the process we achieve a much higher surface finish, cause less damage to the substrate while suppressing up to 92% of the dust caused by sandblasting. 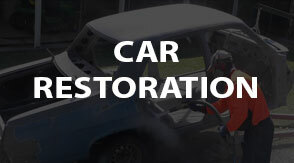 There is such a wide range of applications that EnviroPrep Mobile Blasting can cater to, from car restorations to graffiti removal and antique restoration, that it’s nearly impossible to list all the applications. So drop us a line and see if we can help save you time, hard work and money, all at the same time. 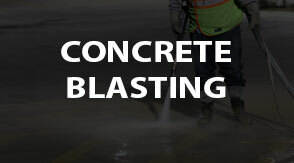 Abrasive blasting is known as a number of other different names such as wet blasting, media blasting, vapour blasting, slurry blasting and dustless blasting. These are all terms used to describe this form of surface preparation which is different to mobile sandblasting. 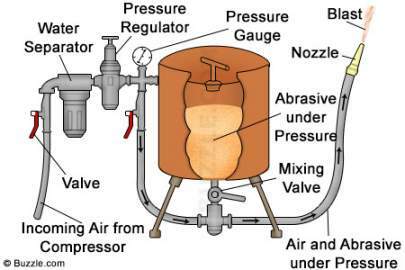 The wet abrasive mobile blasting process works by putting abrasive inside a blast tank and introducing water into the blasting procedure. This drastically increases the mass and energy the blast tank puts out, while reducing the amount of dust that regular sandblasting would produce. Wet abrasive blasting works on the same principal. By adjusting the air pressure and the abrasive and water mixture, allows the operator to remove stubborn surface material or carefully remove surface material from delicate surfaces. A great description of how this works would be to compare throwing and handful of dry sand to throwing a handful of wet sand. The wet sand would impact the surface with more force and will not disintegrate into a cloud of dust on impact like dry sand would. 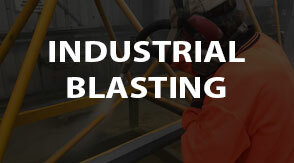 So how does the abrasive blasting process help you? It’s a much faster process – With wet abrasive blasting, we can strip a vehicle fast depending on the surface material. Leave less mess – Water encapsulates the abrasive material, which minimises the amount of dust we produce however we do use containment procedures to clean up after ourselves. Different abrasive material – As long as it sinks in water we can use any kind of abrasive material for the best possible surface finish. Minimal warping – Water prevents friction and unlike sandblasting, our blasting method will not warp metal through the production of heat from friction, however the pressure from the blast nozzle could warp metal that does not have sufficient support structures in place which is why care is need in blasting certain surface types. 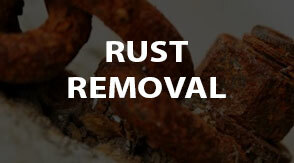 No flash rusting – We use a Rust Inhibitor in our blasting procedures and wash down at the end which decontaminates metal leaving a clean, chloride free, paint ready surface for approximately 72 hrs. We do however highly recommend priming the surface area as soon as possible after the blasting process has taken place to further prevent flash rusting.